As Americans, we have loved and been proud of the National Aeronautics and Space Administration (NASA). Who didn't feel a rush while watching a shuttle lift-off? Who didn't have dreams of adventure when ordinary men and women were allowed to go into space on the shuttle? It wasn't just rocket fuel that got them off the launching pad. It was our hearts, our faith, and our paychecks. Think of all the men and women who worked so hard and those who died to put our dreams in space, and never a complaint from a single taxpayer about footing the bill. From all indications the cover-up has been going on for decades. While researching this information, the one thing I didn't want to do is indict a whole agency and all the decent, honest men and women who work there. However, it is time to pull back the curtain on the wizard. NASA is lying to us. We say to NASA: If you want to lie to us and withhold your findings, fine. Go get your funding privately, we're not going pay for it anymore. We can get someone to lie to us for free! A specific example: There have been too many instances over the years of NASA withholding data and intimidating employees under the guise of national security concerns. So let's just concentrate on one; one you can confirm for yourself. 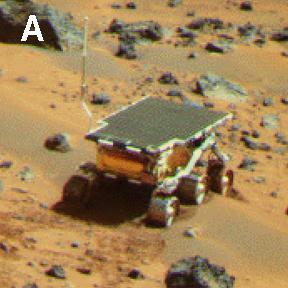 NASA is withholding photos from the public and has gone back and altered the original images that came from the Mars Pathfinder Rover, the little car the scientists that wobbled along and took pictures of the Martian landscape and the rock they named "Yogi." They appear in the 'Photos' section of this website. If you have an image editing program like Adobe Photoshop, or 'print screen' on your personal computer, you can blow up different portions of the images. If you do, you will clearly see where crude alterations have been made. In any images that were not altered what you will see on the blow-up will astound you. Nicks made a close up examination of some of the original unaltered images. (Some of the images were sent in the first seven minutes of the Mars Rover's transmission. These images were apparently not expected by NASA to be transmitted, because the computer program sent them through sooner than expected.) What follows is what he discovered. Here it is in a nutshell: the rocks may not be "rocks." They appear to be artifacts! Artifacts are things that have been made, like when you find an old arrowhead or a piece of broken pottery. What Nicks says is this: If you are out roaming around the desert, you may find a single rock in any one given shape. That is, you may find a rock shaped like a triangle. You may find another shaped like a circle and another shaped like a rectangle. But you won't find a rock with all three distinct shapes in it. You will find this only in artifacts made by intelligent beings. If you blow up many of the Mars Rover images, you will clearly see several different geometric shapes in the same item! You will see many right angles, evenly spaced, and you will see tubes and wheels. You will see items resembling gear cogs, all evenly spaced. This does not happen naturally. For some reason NASA does not want you to see this. Why? We're not sure. Investigations by John David Oates shows that part of the Mars Rover mission may have been the deployment of a weapon. "Hey Charlie, what about the ET craft you guys have seen We paid for the trip, how about some REAL info?" 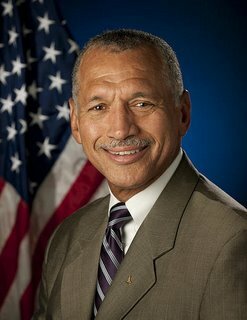 Contact Charles F. Bolden. Call your congressman. Ask for your copy of the high-resolution, unaltered Mars Rover images. While you're at it, ask for the photos taken of the backside of the moon that they never showed the public. After all, they belong to you. You don't have to wait. You can go right now to the Web. Download a bunch of the "rock" images. Start blowing them up on your computer. You can see for yourself.